2011 was my most intense costuming year, and still the female tusken was the only one I finished during the year. 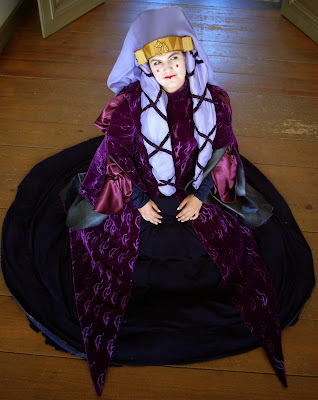 Most of the summer, autumn and winter 2012 was spent on making Amidala's purple travel gown from Star Wars Episode I, also known as the funeral gown. This was a costume that I had dreamt about since 2000, but I never thought that I would actually make it. It would be too expensive, it would be too hard and so on. In 2011 I decided that it was time to make this dream costume though.be I also decided that I shouldn't be cheap or take short cuts, which explains why it took so long. This is my most expensive costume, and the one that I've worked the most with. Most of the photos I used as reference photos for the project can be found here. 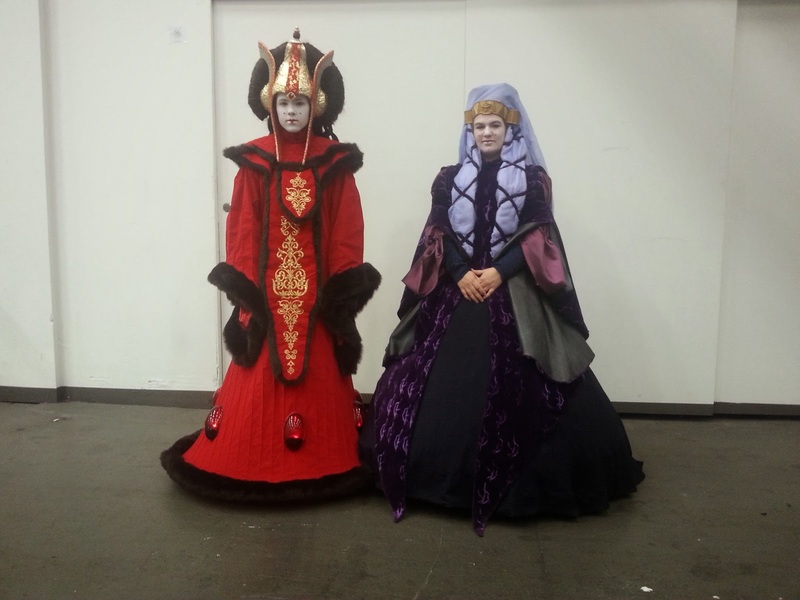 They were taken when I saw this dress at Star Wars the Exhibition in London in 2007 and Örnsköldsvik 2008. All my progress photos were gathered in this photobucket album, and it also includes the failed first tries with the tiar. The first thing was to find a suitable fabric, and that took me several months before I finally decided on a shade of purple. 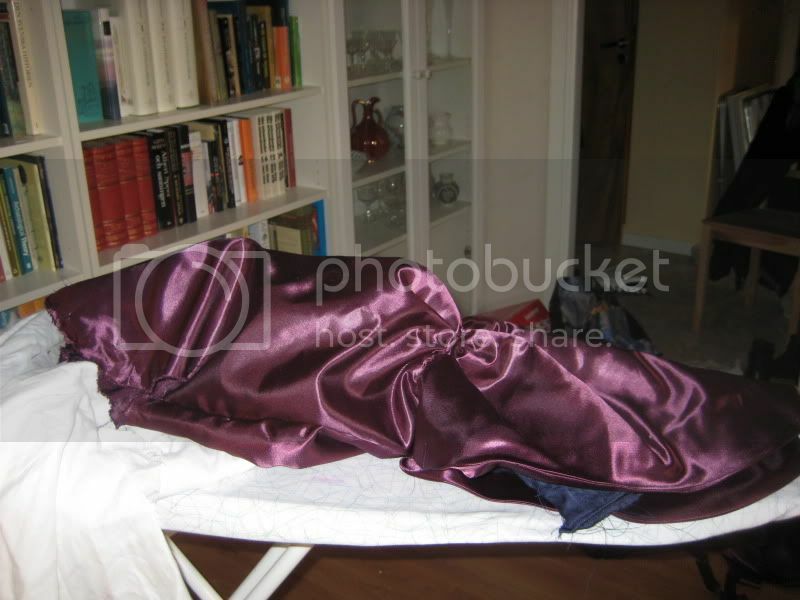 In fact I had it custom dyed, which means that I still have a lot of nice, purple silk velvet in my stash, since the minimum order was 10 meters. The skirt is a navy, brocade jersey. I wanted to have a fabric with a really nice structure, the jersey means that the skirt is quite heavy and doesn't "flow" though. All the other fabrics were different silks that I found on ebay, I bought a lot of swatches and chanced before finding fabrics that I was happy with. 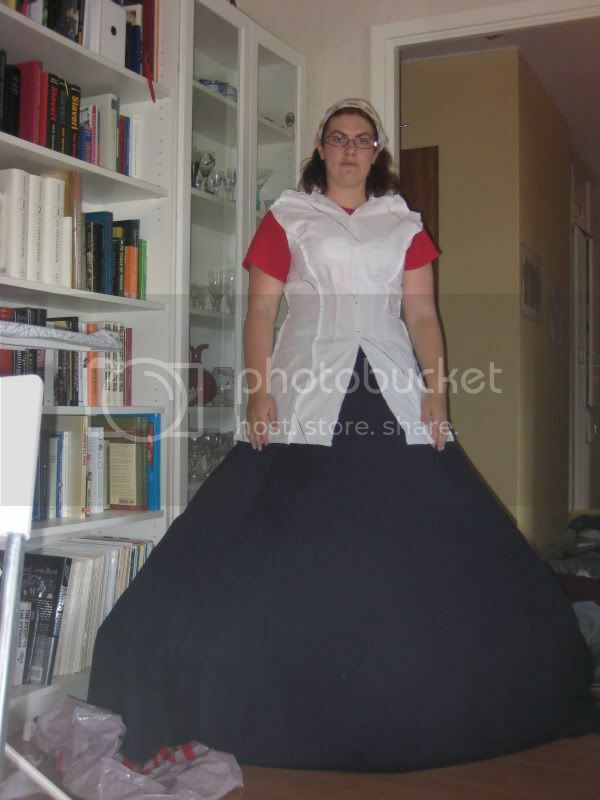 In fact I could make a full ball gown just out of the fabrics that I had ordered but never used for this project. 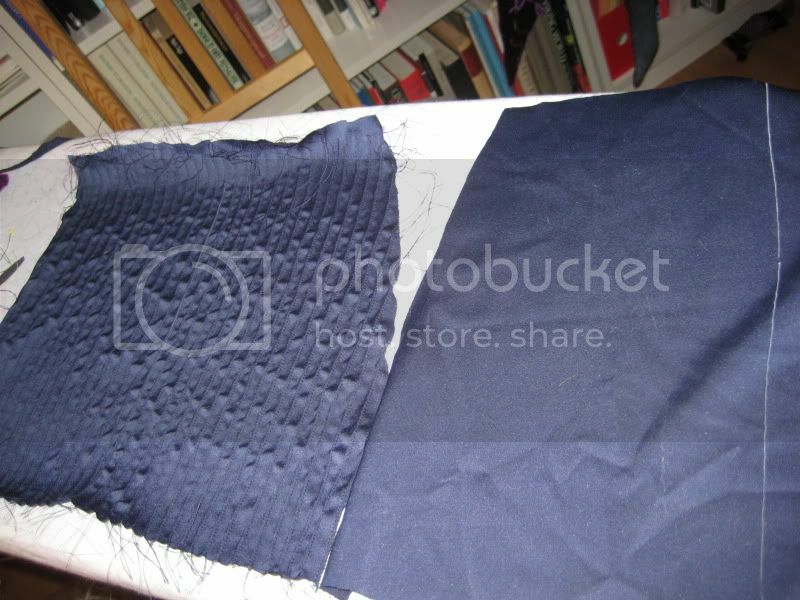 The fabrics that I used in the end was custom dyed silk velvet for the outer coat, navy jersey brocade for the skirt (the bottom fabric in the picture above), some kind of blue dense and shiny fabric for the innermost sleeve (the lighter navy fabric above). That was the only fabric I just stumbled upon in a store, the rest were bought online. 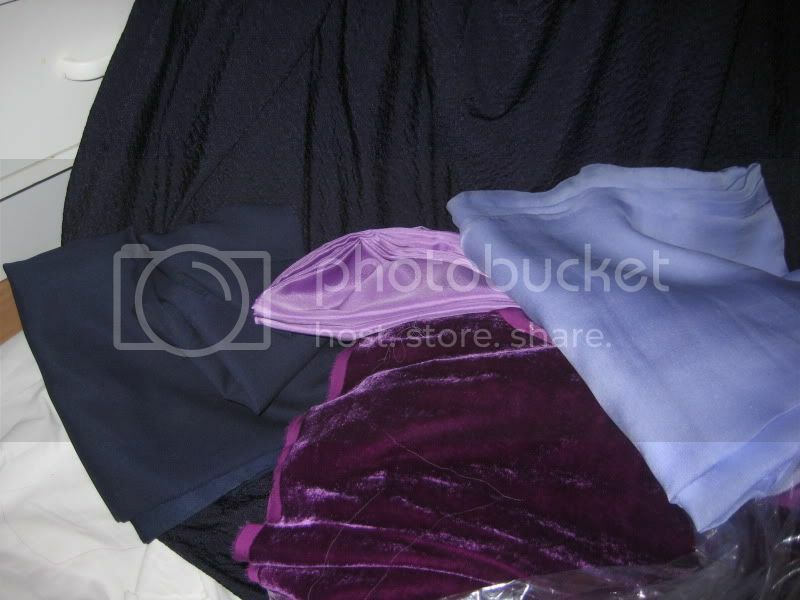 The pink/purple fabric was my first swatch of fabric for the middle sleeves, both the colour and the fabric itself was too light though so I exchanged it for a darker purple silk satin. 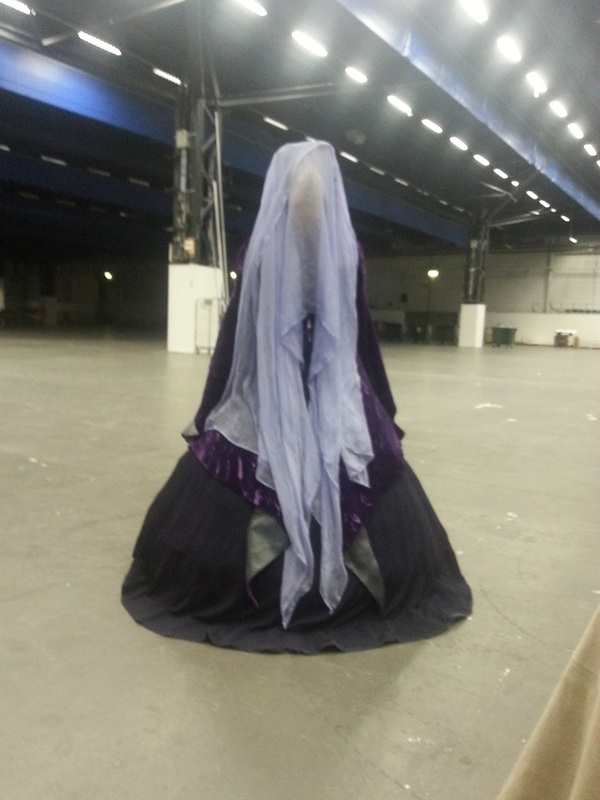 For the veil I used a very light purple silk chiffon. One common thing with these fabrics are that they are almost impossible to photograph and get the right colour. Depending on light the velvet goes from almost navy to bordeaux, and the silk chiffon varies between blue and pink. On the other hand on my photos of the original gown the colours are very different as well depending on light. The first step in the construction was to have suitable undergarments Teenage Natalie Portman is a lot flatter than me, so I first made a pair of 18th century stays just to flatten and smooth out my upper body. This was my first try with making stays, and I tried to enlarge a pattern from marquise.de. Unfortunately I once again failed with this, so I got a pair of stays that were way too big in the front. Still they worked for this purpose of just providing a shape. Some kind of boned support undergarment is necessary to carry the weight of the skirts and the coat. I've tried to wear it once without the stays, since I was in a hurry to get dressed, and in the end my back hurt a lot. With boned stays it's the bones that carry the weight, and of course also gives you that regal posture that a queen should have. Under the stays I'm wearing a linen chemise. It will never be possible to wash the velvet coat, that would ruin it, so the chemise is essential to make sure that sweat and dirt don't get to the coat. I used linen for comfort, there is a reason why that has been used for undergarments through all times. 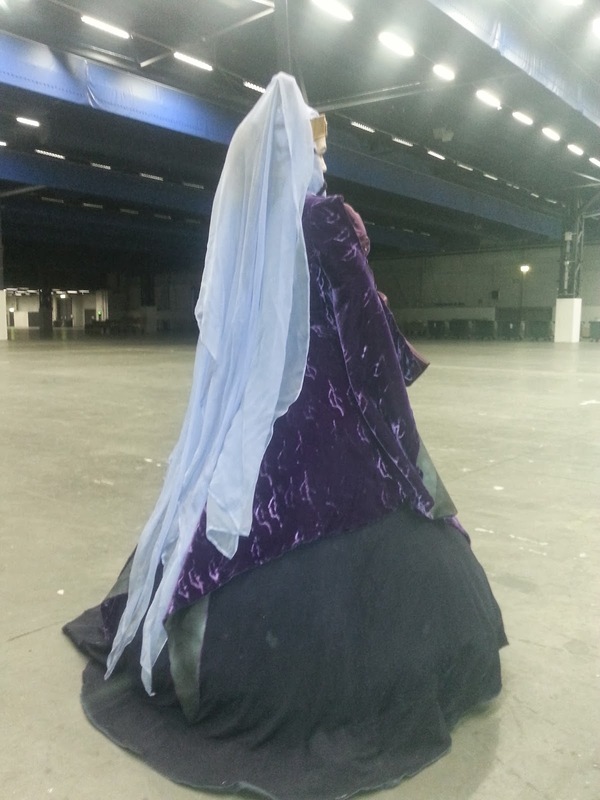 For the petticoat I used the bridal hoop skirt that I had bought for my 1860's ballgown. The pyramidal shape mimics the original quite well. Here it is also a question of proportions. My skirt is bigger than the original, but since I'm also wider than Natalie Portman I felt that a full hoop skirt gave me the best proportions. Over the hoopskirt is a flounced petticoat in cotton voile. The bottom ruffle was made out of the same fabric as the skirt, so that it wouldn't be visible if it peeked through. 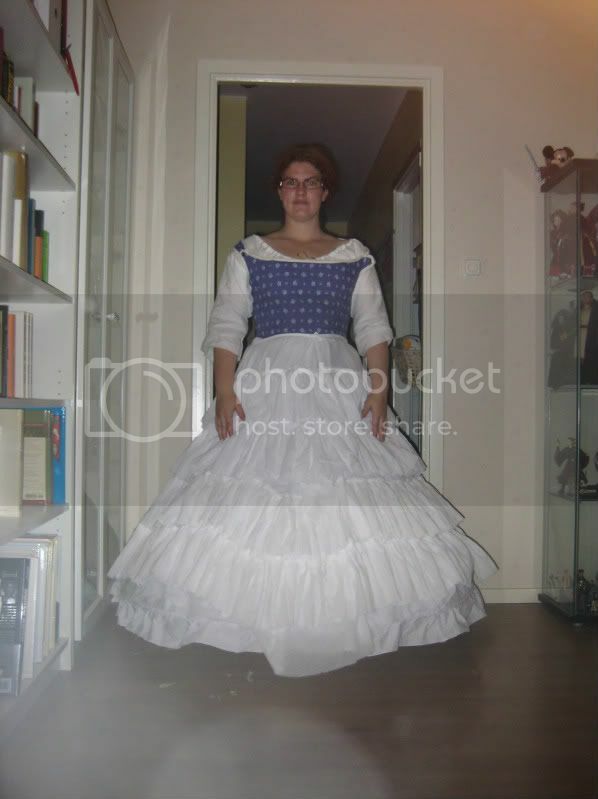 Unfortunately the heavy jersey in the skirt means that the hoops are visible when I walk, even through the petticoat, and the hoop skirt gets quite flattened. * It looks good when I'm standing though. The main challenge was the outer velvet coat. I would never try and drape my own pattern, but give me a pattern as a starting point and then I can change it so that it's almost impossible to recognize. For the coat I started off with this pattern, from my sister's stash. It's some kind of quite ugly 1980's ensemble and I chose to work from the red coat/jacket pattern. 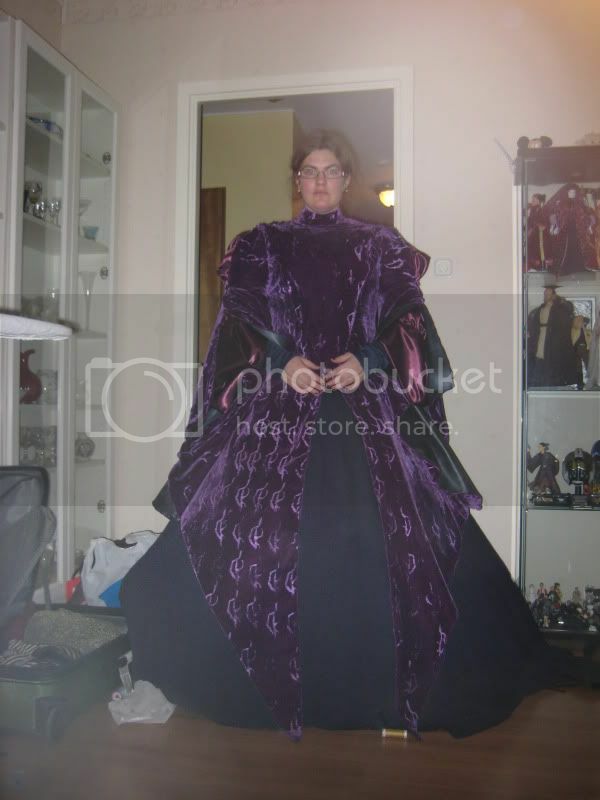 What I looked for though was a front with darts instead of several pieces, a flared skirt and a seam at the center back. Then I started to fiddle with the pattern, and a lot of old beds sheets. I sewed up the center front seam, so I had to remove excess fabric from the turned up collar. I had to change the seam at the shoulder and remove excess fabric, since I wasn't going to use shoulder pads. Then I had to make sure that the whole bodice fit tight, and not like a coat. I added extra fabric to make the full length points of the coat in the front and the back. One important thing here is that the front point aren't really angled. They are as straight as the center front seam, and it's only the huge skirt under that make them point to the sides. For the sleeves I used the sleeve pattern from McCall's 4491, my Lord of the Rings pattern, sewed it up according to the pattern, and then cut it up where I wanted the openings to be. The full sleeve is open all along the upper part of the arm. When I had pieced together my first muslin I cut it up and made a version two of the muslin, where I made sure that the front, back and sleeve were all in one piece each. For this stage I only made half the muslin, since I only wanted one pattern piece that I could use for the final pattern. When I had gotten this far I was actually quite nervous to start cutting into my very expensive velvet. Instead I turned to making the beaded trim that criss-crosses around her "hairbags". I couldn't find any beaded trim, so I bought several rolls of velvet ribbon and then I sewed on a couple of thousand beads to them. Just this stage took me around 1,5 month to finish. Then some things happened in my personal life that simply made me take a break on the project. That meant that when I finally had energy to start again, well then it was only two months left until the 3D premiere of Star Wars Episode I, and that was my set date for the whole costume. I cut the fabric, but that wasn't enough. Before I started to assemble the coat I had to print the pattern all over the fabric. 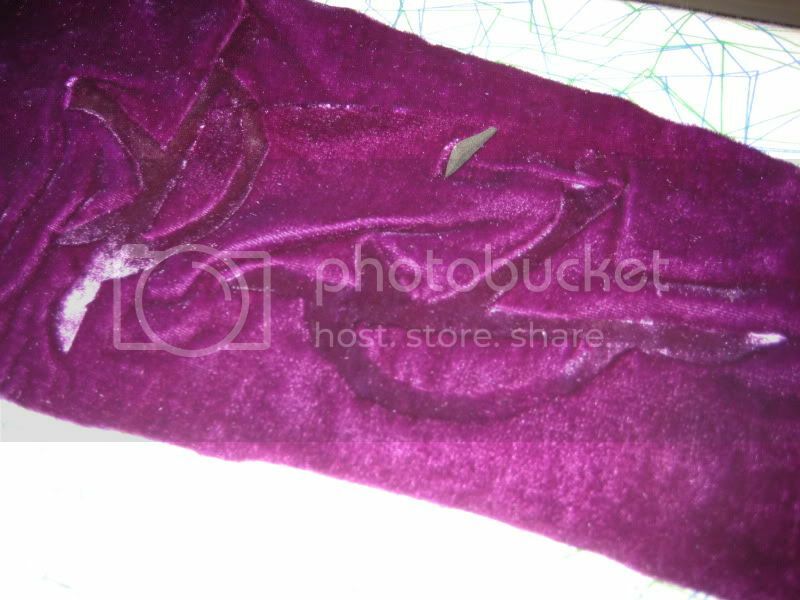 I read up quite a lot on printing/stamping velvet, and I didn't dare work with chemicals for embossing it. In the end I made a simple stamp out of craft foam and used an iron. The stamp also had to be strengthened with some wire to keep its shape. The technique is to first wet the velvet, then you put the stamp on your ironing board, put the fabric over the stamp, with the right side down, press straight down with a hot iron until it stops hissing and then lift the iron. I used an old iron that I borrowed from my mother, that didn't have any steam function. 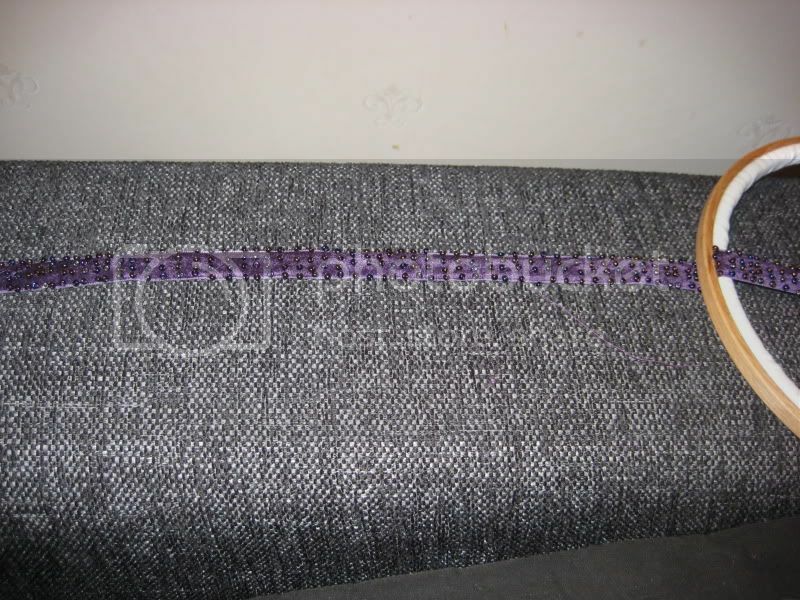 And I should also say that I turned the coating of my ironing board purple after pressing a lot of damp velvet on to it. This also took me around one month to finish. sleeves. For the first layer of sleeves I made narrow tubes from the elbown and down to my hands. The original sleeves are ribbed, and I recreated that by doing row after row with pin tucks, my pin tuck presser foot was a life saver here. The middle layer is a big, puffy sleeve with a petal shape opening that is then folded back. 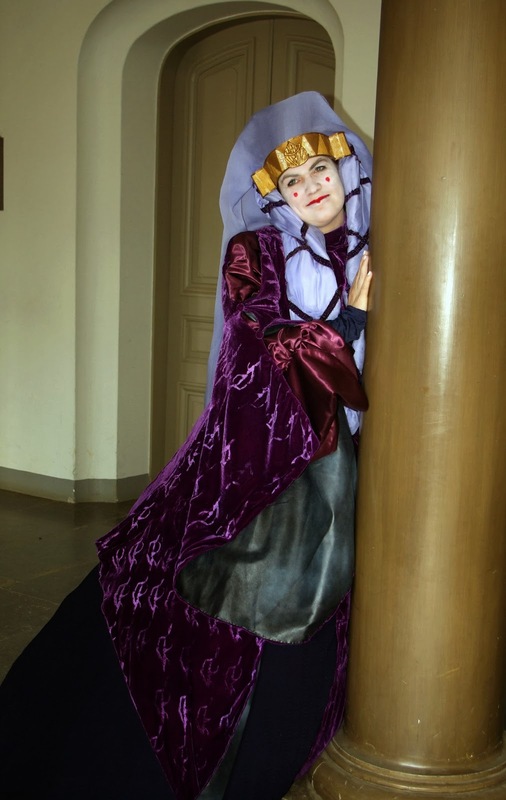 It's a bit hard to explain, but Cassandra has a good explanation of the sleeves in her costume diary. I can't really remember, but I think I used the sleeve pattern from McCall's 3797 for the puffy sleeve, and freehanded the petal shape. I then sewed the narrow inner sleeves to this middle sleeve. With the inner sleeves done it was only to start assemble the whole coat. 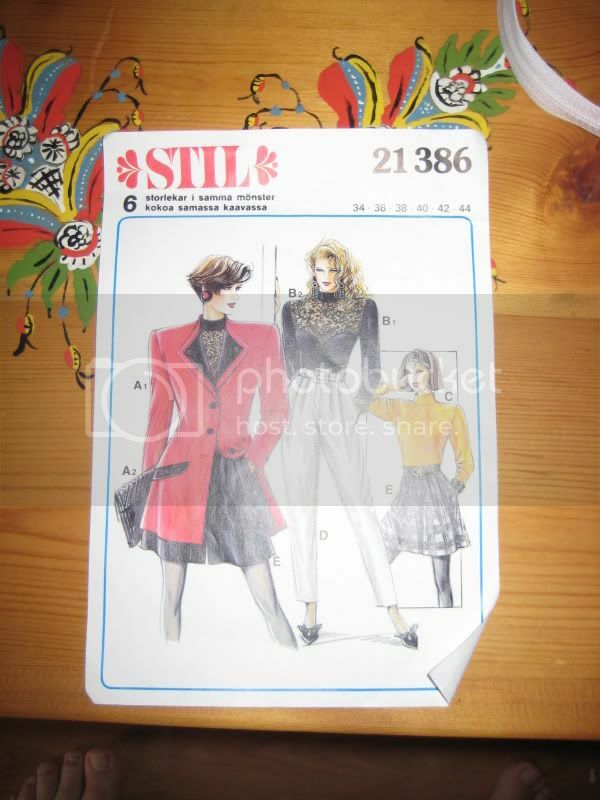 The points of the coat and the big hanging parts of the sleeves where lined with faux leather. I know that the views on this are divided among us who have made the costume. I only say that the leather/faux leather makes the coat very heavy, but it helps a lot with keeping the shape of the points, especially in the front where the tip of the points are actually on the floor, in front of the gown itself. The faux leather was originally black, but I dusted it with a thin layer of gray/silver spray paint to give it a lighter and more shiny apperance. At the front there is also a stomacher, which is basically a triangle that goes from the shoulders and end below the waist. I think that in the original it's fastened on, and then you have to closure of the gown under it. I sewed it on permanently though and have a zipper in the back to get in and out of the costume. The zipper can't be seen under the veil. From the shoulder seam and down the sleeves there are also a row of buttons, self covered in the same fabric as the coat. These buttons are the only thing keeping the sleeves shut, and still allowing the undersleeve to peek through. I have sewn everything though and just added the buttons as non-functioning decorations. The veil silk chiffon that's draped over a hairpiece. 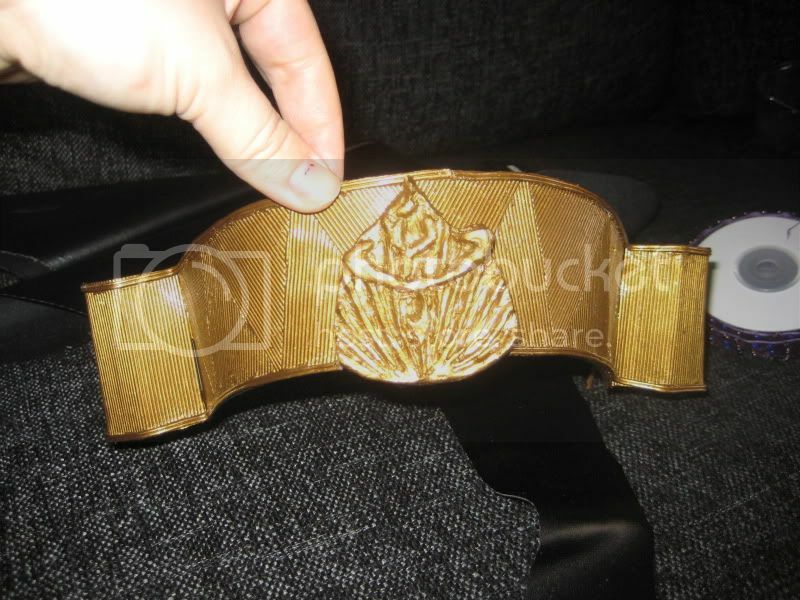 Or rather in my case it's actually just an alice band with a structure of craft foam glued to it. One day I would like to make a proper hairpiece, but to be honest it's invisible anyway. Framing the face are two "hair bags". They were trickier than I thought. I first made a bag, but it was too round. In order to get the flat shape I cut it out in batting, covered that in one layer of the silk chiffon, and then I made a casing for them out of a second layer of chiffon. I want to emphasize that quilting batting, the flat kind, is a lot better to give the right shape rather than just sewing a tube and stuffing it with something else. The hairbags should be flat. Then the beaded ribbons were sewn on to the hair bags. 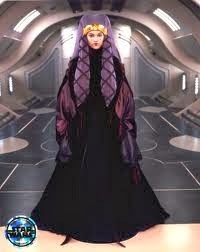 If there is one thing I want to change with this costume it's the veil and the hair bags. I was in a bit of a hurry when I made them and there are are some issues with the hair bags. Also the original is made in a changeant chiffon, that I simply couldn't find. 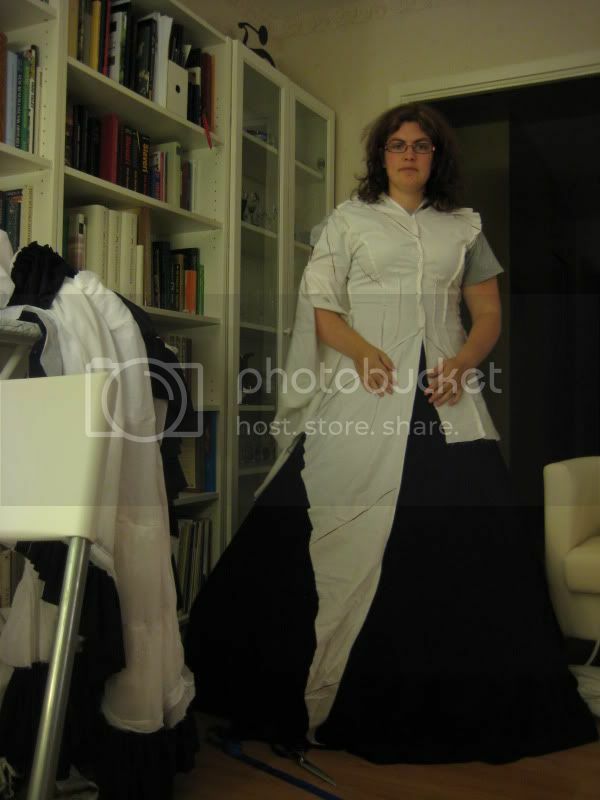 I have the right texture, with small ribs in the fabric, but I would love to get my hands on changeant chiffon for this. ** Also the original has some kind of beaded decoration in the corners of the veil, and I haven't added that. The wonderful tiara was made by a friend of mine who gave it to me as 30th birthday gift. All in all this is the costume that I'm most proud of and I definitely think it's worth all the time and money that I put into this. * The problem I've mentioned at the top with the hoops of the hoopskirt being visible went away when I added another petticoat in 2013. I simply added one of my thin cotton voile petticoats from my 18th century wardrobe and that was enough. Since all the petticoats and the hoopskirt is tied with ribbons around the waist it gives a bit of bulk there, but it's hidden under the sleeves. In hindsight I would have made several thin petticoats rather than the quite bulky flounced one. **When I was in London in December 2013 I got my hands on changeant chiffon so I'm hoping to have time to redo the veil and the hairbags some time during the year.